By Patrick McHugh: Two Olympians will be facing each other this Saturday night in a light heavyweight match-up between unbeaten Russian Artur Beterbiev (9-0, 8 KOs) battling Ezequiel Maderna (23-2, 15 KOs) in a fight televised on ESPN from the Bell Center in Montreal, Canada. The Beterbiev-Maderna fight starts at 11:00 p.m. ET. on ESPN. While the fight is supposed to be competitive up to a point, the 31-year-old Beterbiev is expected to win the fight by a knockout. 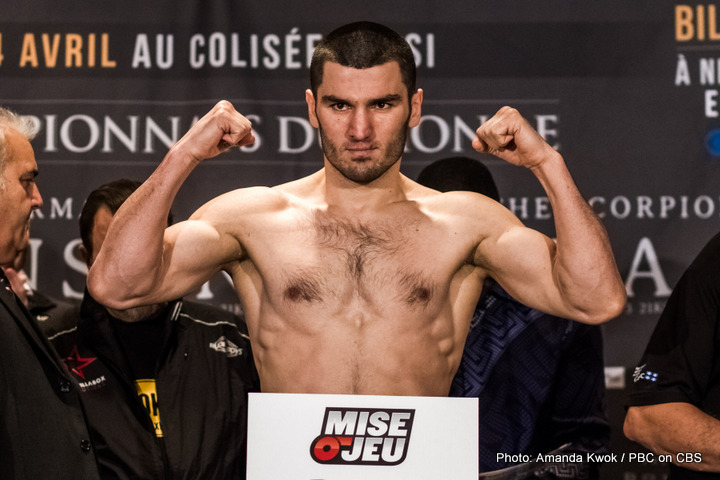 One thing that is unknown is how Beterbiev’s surgically repaired right shoulder will be for the fight. This is the first match for Beterbiev since his shoulder surgery and he’s been out of the ring for a year now since his last fight. It’s unknown what kind of shape his shoulder will be after that much time. Beterbiev is potentially two fights away from fighting in a title eliminator for a shot at IBF/WBA/WBO light heavyweight champion Sergey Kovalev. Beterbiev and his promoters will have a good idea where he’s at after the Maderna fight. There could be some rust for Beterbiev due to him missing an entire year with his shoulder injury. Beterbiev cannot afford to wait a lot time before he challenges for a world title because his age is already fairly advanced for a fighter with just three years of pro experience. Beterbiev had brutal knockouts over Tavoris Cloud and Gabriel Campillo in the past. Both knockouts were early ones. Beterbiev’s last fight was against Woody Johnson last June in his 7th round knockout win. Kovalev will likely take a good deal of interest in watching Beterbiev’s fight because he’s going to likely wind up facing him in the near future if the two of them can keep on winning. Kovalev will be fighting next month on July 11 against Isaac Chilemba in Russia. After that, Kovalev will be fighting Andre Ward in November. Beterbiev already beat Kovalev when the two of them were amateurs in Russia. Beterbiev believes he’s still got Kovalev’s number. If that turns out to be the case, then Beterbiev will be the new top dog in the division for a while. It could be one of those situations where Beterbiev just has the style to beat Kovalev, but not the style to defeat other top guys like Ward and Adonis Stevenson. Those guys would be tough fights for Beterbiev because they have fast hands. What Beterbiev has on his side is a great inside game that would help him defeat those fighters if he ever gets a chance to fight them. Beterbiev had been planning on facing previously undefeated Sullivan Barrera last year in November in an IBF 175lb eliminator. However, Beterbiev suffered a shoulder injury and Barrera had problems with his visa which made that fight impossible to make. Maderna is a good fighter. He’s only come up short in a couple of his fights in the past against good quality opposition.